Editor’s note: This is the sixth article in the AZNG Leader Spotlight series, a collection of features about the diverse experience and leadership perspectives of Arizona guardsmen. Join the conversation on social media using #AZNGleaderspotlight. Comment on these articles with your take on leadership and nominate other AZNG leaders you think should be featured. PHOENIX – It’s Monday, 5:45 a.m. The sun has barely crested the horizon over the buttes at Papago Park and most people have not had their first cup of coffee yet. Except that is, for Chief Warrant Officer 5 John Vitt, deputy garrison commander of the Papago Park Military Reservation. He has already arrived a work, hours before most have begun negotiating their way through the morning rush-hour traffic. His office, a small nine-foot-by-nine-foot room with just enough space for a small desk, filing cabinet, and a bookcase, has a mixed clutter of boxes and sports memorabilia peppered throughout the room. The prominent décor being that of bald eagles and NASCAR, two of his greatest interests. His day begins by reading the garrison’s security forces blotter from the day before so he can prepare a leadership brief. As the morning passes and offices fill with life, Vitt’s phone begins to ring. He fields questions about signage needed to direct patrons to an event being hosted on base later in the week, and calls related to timecards for dual status federal technicians and a request for military leave. 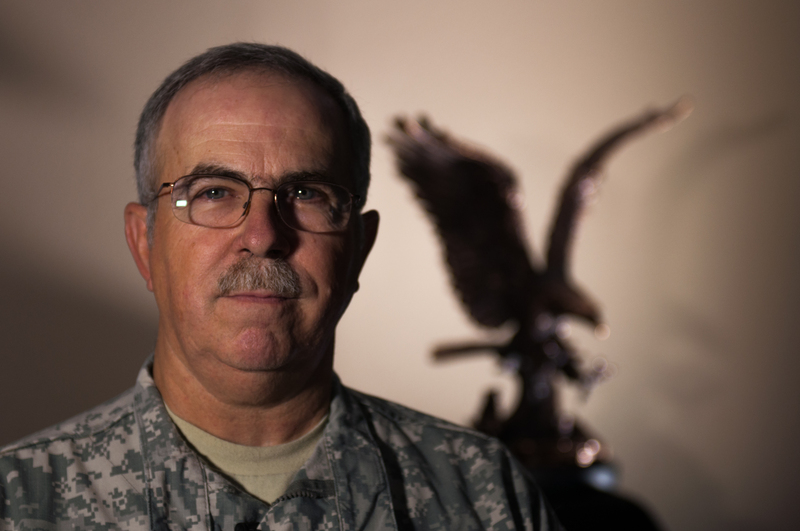 With over 41 years of military service, Vitt has become a wealth of knowledge in all areas of the Arizona Army National Guard. He always makes you feel as if your personal request of a favor is never a burden, and that there is no limit to the personal sacrifice he is willing to make. Many would agree that a person who dedicates 20, 25, or 30 years of their life to a career would have more than done their part and earned their place in retirement. But what of the person who has dedicated over four decades of selfless service, fulfilling a personal duty to defend and protect the people of the United States and the State of Arizona? Born in 1956, the oldest of nine children, Vitt learned early on that he wanted to relieve the burden on his parents by working hard and being successful on his own right. After graduating high school in 1974, he received an appointment to the Air Force Academy but due to wavering grades in English he first had to attend the Air Force Academy prep school. When he experienced the only negative setback to his career, in that he was unable to raise his English grade in time to attend the Academy, he began his military service as a missile systems technician in the U.S. Air Force. After his two-year active duty commitment ended, he re-enlisted in the Air Force Reserve at Luke Air Force Base and worked in Flagstaff, Arizona as a vehicle mechanic. In March 1980, after learning that the nearby Navajo Army Depot, known now as Camp Navajo, was expanding to include a new ordnance battalion he enlisted into the Arizona Army National Guard as an equipment records and parts specialist. This move allowed him to continue to serve, with the convenience of reporting to a unit only miles away from his Flagstaff home. To no one’s surprise, Vitt’s transition to the Army National Guard came with continued success. In August 1983, he was promoted to sergeant, but the greatest milestone was his direct appointment to Warrant Officer in February 1985. When people are fanatically dedicated to a personal goal, professional advancement, or organizational success, it is because they feel that without their hard work and dedication the desired end state may never be met. Chief Vitt continually takes on every project and challenge, volunteering to help any way he can both inside the guard and in the community. As a master of time management, Vitt never lets an obligation go unfulfilled. He has been an active member of the National Guard Association of the United States since 1986, has served as the President, Vice President and many other roles for the Arizona chapter, and has served on a number of national-level committees. In 1991, he joined Epsilon Sigma Alpha, an international leadership and service organization focused on making a positive impact to the community. In 2013, he began volunteering with the USO at the Phoenix Sky Harbor Airport and has logged nearly 700 volunteer hours to date. Whenever a person meets Vitt for the first time and learns about his length of service, they seem to uniformly ask the same two questions; what keeps you doing what you do this long, and how many deployments have you had? To some degree, there is a perception of a Soldier’s experience and potential in correlation to the number of deployments and combat experience they have. If anyone has proven that this is a false assumption, Vitt has done just that. Even as he explains his position, he remains reserved about not having gone overseas to represent Arizona and the United States as he always expected to when he signed his first contract for military service 41 years ago. Vitt had known many members of the Arizona National Guard who have come and gone during his time in service and he reflects back to the time that Maj. Gen. David Rataczak, Adjutant General of the Arizona National Guard, retired in 2013. Maj. Gen. Rataczak had served in Vietnam as a Warrant Officer and later commissioned as an officer. For his retirement, the organization wanted to put together a shadow box of all the ranks he had held throughout his career. The most difficult rank to obtain was a pre-1972 Warrant Officer rank. Unable to locate one for a reasonable price and one that would be available in time for the ceremony, Vitt donated the Warrant Officer rank from his own private collection to complete the plaque. A few weeks later, Vitt received a small package in the mail from Rataczak. Inside was a tarnished and obviously used Vietnam Warrant Officer rank with a note. In the note, Rataczak explained that he wanted to replace the rank that Vitt gave him with the original Warrant Officer rank he wore on his uniform in Vietnam. Vitt has always taken a front row seat to celebrating the many personal and professional milestones of fellow guardsmen and community organizations, often downplaying his own accomplishments and contributions. When asked about the secret to his success, Vitt gives full credit to his wife of 36 years, Roxanne and their two children Christopher and Amanda. With the successful conclusion of his career, he plans to open a new chapter in his life filled with travel and leisure.